Since Demon’s Souls arrived on the scene, From Software has been elevated as one of the premiere developers of their own take on ARPG design: AKA the Souls-Like. Since then, when the company does make a game that doesn’t involve the word “souls” in the title, people take notice. Last time we got Bloodborne which was the most action-focused take on their design until now. Sekiro Shadows Die Twice has pushed the Souls-Like in a new, and more action direction… that just may be completely broken. Sekiro takes place in feudal Japan during a time of war. You play as the mysterious shinobi known as Wolf. We find him with amnesia on a quest to rescue the lord he has sworn to protect. Things don’t turn out so well and he loses his arm to his enemies. Standing in his way on saving his charge are armies of bandits, animals, monsters, and his own forgotten memories. There is so much to unpack with Sekiro from a design standpoint, let’s start with how this game breaks the Souls-Like tradition. There is no more stamina, equipment, and leveling up. Instead, all abstracted progression occurs through making progress in game. Mini-boss (yes, there are mini-bosses now) and boss-class enemies will now drop resources that will allow you to upgrade your health or damage potential. Killing enemies will still reward you with experience, but that experience is now used for the game’s skill tree system. You can spend accumulated skill points on new moves, passive abilities, and more. Unlike the Souls series that kept the player on the ground, Sekiro is all too happy to let you move, jump, and grapple your way around. After you lose your arm during the intro, your new prosthetic arm grants you the ability to grapple. One of the major changes Sekiro brings is a new philosophy on level design. Previously, Souls-like levels were very narrow in terms of their design with a focus on shortcuts. You weren’t able to freely explore the map outside of the paths that were hardcoded by the design. Here, the levels are far wider in their design to make use of the new grapple and movement systems. Instead of corridors, the levels are made up of large areas. In my opinion, this does delude the design in previous souls-likes. Due to how wide the environments are, it’s not as easy to build a mental map of the levels. And just like with previous souls titles, it’s easy to miss alternate areas, NPCs, and more. From what I’ve played so far, the actual designs don’t stand out in the same way as memorable levels like Anor Londo, Blight Town, and others did. A big reason is that fast travel now works from the beginning, and that means the levels didn’t need to be made as connected as there are travel points occurring multiple times in each area. 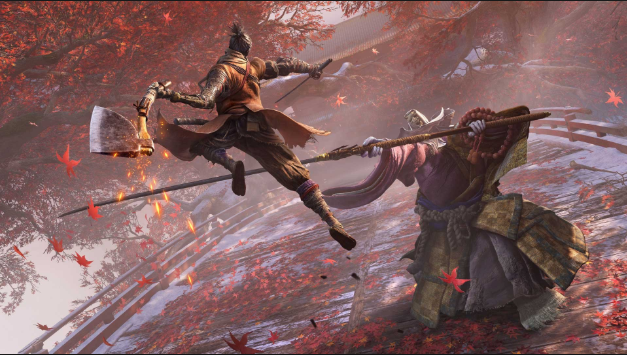 A big part of the new design has to do with Sekiro’s other system besides combat — as From Software embraces Assassin’s Creed. We’ll get to combat soon I promise, but a major aspect of the game’s design is the new focus on stealth gameplay. While you are still best at fighting enemies one on one, each area will always be full of enemies either standing around or patrolling. Performing stealth kills allows you to widdle down groups or take out the strongest enemy first. More importantly, you can start a mini-boss fight already doing massive damage to them if you can engage them with stealth. As with other stealth games, all your bread and butter moves are here — peaking around walls, hiding in tall grass, stealth kills from above, and more. If you are spotted, you can leave an area and wait a few seconds for the enemies to disengage. Not every encounter can be handled with stealth, and the game will not let you engage bosses with stealth attacks. With all that said, it’s finally time to talk combat in Sekiro, and where Dark Souls fans are going to be in for a rude awakening. If you’re expecting Sekiro to be like Dark Souls, or even Bloodborne, there is nothing like those games in this one. This is easily the fastest game from a combat perspective From Software has put out; taking the crown away from Bloodborne. Combat is more focused on out thinking your opponent instead of just attacking them. Every enemy in the game has health and a posture bar. 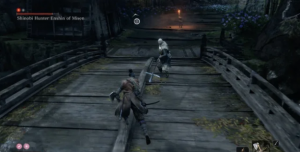 As you attack an enemy and keep on the offensive, the posture bar will fill up. Moving away from the enemy or being defensive will begin to drain the bar. When the posture bar is filled, you are able to perform a “deathblow” on an enemy — instantly killing minor enemies. For the bosses and mini-bosses, they will have multiple health bars that you must go through to defeat them. Getting a deathblow or stealth attack will use up one of their bars. As you fight an enemy, the more health damage you do to them, the easier it becomes to build up posture. All the while, the enemies will be attacking you. You have your own posture bar and can be staggered if you block too many attacks. You’re going to quickly find in Sekiro that attacking is the best strategy for combat, which is an odd thing to say. Playing defensively will not move the battle along — you need to get at the enemy and learn its tells to start doing either health or posture damage. By timing your blocks, you can parry attacks and increase their posture bar as well as performing a counter slash. Dodging sets up for a counterattack that does increased health damage. Enemies will quickly start using unblockable attacks that each has a specific counter. Thrust attacks can be stopped with a specific perk, sweeps can be countered by jumping and kicking them, and grabs can be dodged and then followed up with a counterattack. The general rule of thumb is that dodging is always the best defense — it avoids the attack and lets you do damage, making it easier to then start parrying. However, every enemy is different: some enemies are too dangerous to parry, other ones may have so much health but can’t reduce posture easily. While all this sounds great, Sekiro’s design feature some issues, as it commits multiple action game sins. 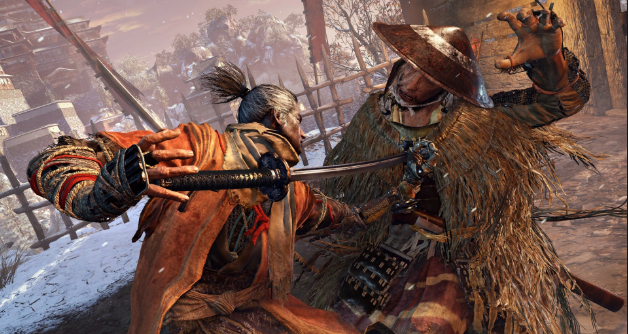 The best action games are all about giving the player the tools to succeed and requiring the player to effectively read their opponents and react; unfortunately Sekiro fails in both parts. Despite being a shinobi, you seem to be the slowest attacking character on the field. Enemies are able to dodge around you, they can interrupt your attacks, and their combos are longer and more damaging. Given the speed of enemies, I was surprised to find that there is no dodge canceling, or any canceling of animations in this game. At most, you can dodge before your attack animation initiates, but that’s it. If an enemy begins their attack while you are attacking, there is no way to avoid damage. Sometimes enemies can be interrupted, but most of the time you’re going to take damage. Compounding matters was that I noticed Wolf getting animation locked if he gets hit — making the player take more damage if any part of a combo connects. The game also doesn’t recognize that you’re holding the block button if you are hit, you have to reapply block for the game to start blocking again. In terms of action game design, Sekiro possibly features the most number of attack animations I’ve seen in a videogame, and that’s good and bad. As the player you constantly have to adjust strategies depending on the enemy you’re fighting, but the game makes it frustrating to do so. Further up, I talked about the game’s three defenses — parrying, dodging, and jumping, and how they were built to counter specific attacks. The problem I have with Sekiro is that it’s impossible on reaction to read what defense to use when. This isn’t a game where just looking at the enemy tells you what attacks to expect. Enemy attack animations are fast, and similar to Souls games, the same starting attack animation can lead into different combo patterns. Does this attack require parrying, or is it a jump? You’re not going to be able to answer that until the enemy hits you for a lot of damage. The biggest frustration is when enemies perform their unblockable moves. You get a massive Kanji symbol on screen that doesn’t tell you what to expect. Misread the animation — or not see it due to the camera — and you’re going to take a lot of damage or die outright. I had a lot of problems with the camera system that compounded matters. There were times when I was locked on to an enemy and the camera would get stuck or not show things at the optimal angle. When you’re playing a game that requires you to properly read animations, it becomes kind of difficult when you can’t see them coming. Then there were situations where the lock-on would disengage for no reason. I also ran into problems when on-screen graphics like parrying or even reviving blocked attack animations. 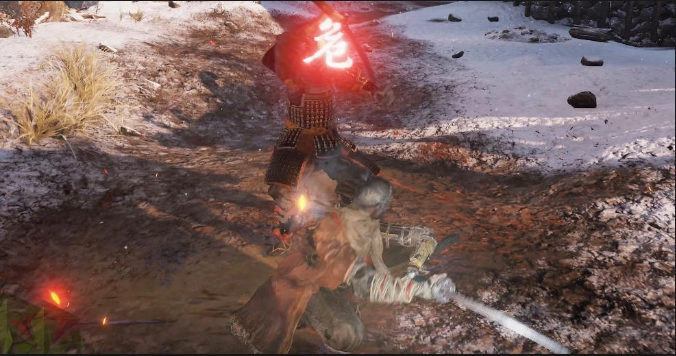 The camera really does add a lot of frustration due to how much combat is focused on enemy animations as opposed to the improvisation we normally see from action games; and let’s be frank; Sekiro is not an action game despite what people will tell you. Ultimately, I’ve come to the conclusion that Sekiro is not an action game, but a Kaizo game. You simply don’t have the tools to improvise or react. Enemies are programmed to auto-block all attacks once you are in combat. The only way to win is to know ahead of time what attack animations the enemy will use and counter them, and that takes time and a lot of dying. Despite the random pattern design of the enemies, this is a mechanical game. If an enemy can only be defeated by counter slashing, then that’s it. Attempting to parry or jump and you will never be able to beat that enemy. When you run into shield enemies, your options become reduced to only a few ways of getting by them. This “my way or the highway” approach is straight out of kaizo design. 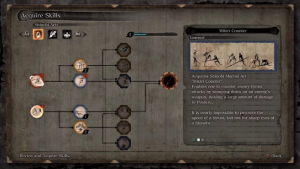 There is no improvisation in a kaizo game: the whole point is performing a set number of maneuvers perfectly in a row, and that’s what Sekiro is. 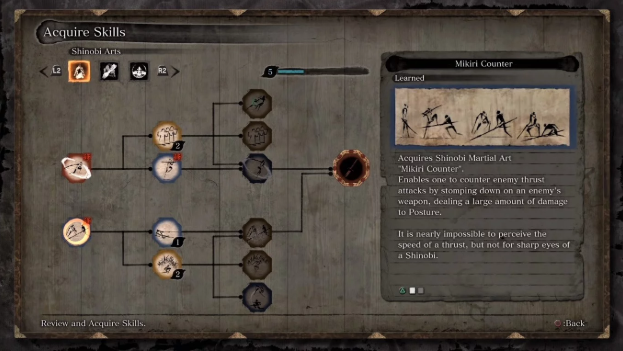 I’m also reminded of the game Karateka, which now that I think about it, is Sekiro’s mechanical design taken even further. The entire point of Karateka was that you were only able to react to the enemies — you could not instigate your attacks, but had to respond to theirs. Enemies will always auto-block when you attack them regardless of angle. I’ve noticed that the individual enemies have less attack patterns compared to the Souls series; most likely to compensate for the fact that the player has to read the patterns more closely and because of the overall increased number of them. The design difference between Sekiro and other Souls games really comes down to this mechanical gameplay. In previous titles, a boss fight was dependent on both the enemy and your own build. Fighting a boss with spells was different from a strength build, or range, and so on. Here, the only thing that matters is the boss patterns itself and not the player, because there are no builds. Each boss is a brand new experience, and you’re going to have to figure things out. With that said however, this is not the kind of game where you want a trial by fire, and that’s because of the punishment system. It wouldn’t be a Souls-like without having a punishment system and some kind of confusing mechanic. 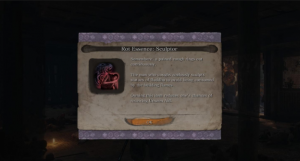 Sekiro’s confusion comes in the form of “Dragon Rot.” Wolf also has additional lives similar to the bosses in the game. When you die, you can come back to life a fixed number of times before you’re actually “dead.” Every time you die and respawn, you lose experience and your sen (or money) amount gets halved. You have an attribute known as “unknown aid” that gives you a chance of not losing anything when you die. 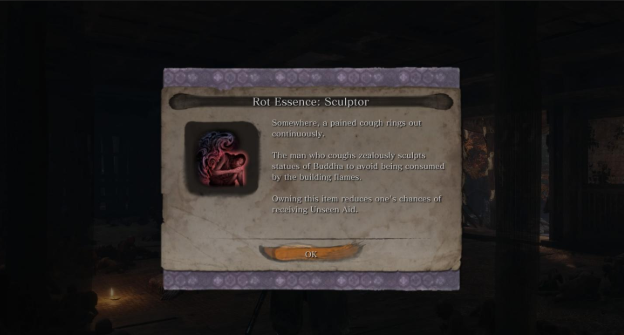 However, the more times you die will spread a disease known as dragon rot. This begins to affect the NPCS who give out quests or sell items. Every time you acquire another dragon rot point, your unknown aid chance begins to drop. In this regard, From Software makes the same weird design decision that they were criticized for in Demon’s Souls: Having a mechanic that makes the game harder for lesser skilled players. From the lore, I thought you were penalized for using the revive points too much in the game, and purposely took a lot of deaths from it. Instead, it was the opposite, and that made things harder for me while trying to learn the game. That is simply bad design — there is no risk/reward element to it, it doesn’t affect expert players at all, it’s simply a long-term punishment mechanic that affects the players that don’t need more punishment. This can also mess you up when you start losing more skill points and money needed to start acquiring important skills and items. Not only that, but if you don’t cure people affected, NPC quest chains will become disabled. A better designed system would have been making dragon rot a chance to rise every time you have to revive in the middle of combat, but not dying and returning to the checkpoint. That way it becomes a risk vs. reward system and doesn’t punish someone for learning the game. The game also once again forces the player to rely on consumable items for important strategies. Here, your prosthetic arm can be equipped with a variety of tools: some allowing direct counters against specific enemies. However, you have to either collect spirit talismans or spend money to acquire the item. And as always, if you get stuck at a fight and are constantly dying, you’re not going to have the money or resources you need to keep fighting the boss effectively. There are also plenty of items used to enhance your stats, do additional damage, and other effects that can be very useful to the point of being required for some situations. And again, run out of resources and the game becomes frustrating to play. For lesser skilled players, they’re going to find a game that is even harder to learn than the Souls series. One of the beauties of From Software’s previous games was the fact that there was always a way for someone to get past a challenge. The RPG abstraction allowed lesser skilled players an out if they couldn’t beat a section with skill alone. The design still rewarded skill, but you had the RPG layer as both a support and crutch for players. Not only that, but you had the summoning system for when you really needed a helping hand. With that said, none of those elements are in Sekiro. Vitality and damage upgrades are rewarded for beating mini-boss and boss class enemies respectively (there are some hidden upgrades, but they are rare); the only thing you can grind are skill points. If you get stuck at a fight and you cannot figure out what you’re doing wrong, then you are done with this game. I remember reading an interview with the lead designer saying that he wanted Sekiro to be more accessible to new players, and in that regard, this is a design failure. I cannot imagine a new player to any action or Souls-Like experience wanting to play through Sekiro once the punishments hit. Finally, what frustrates me to no end is how the game seems to play by its own set of rules and changes them when it feels like. 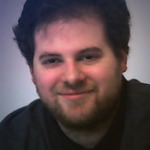 Action games have to be designed around a give and take between the player and the AI. Naturally, enemies are designed to have their own rules or break the normal conventions, and that’s fine. The problem is when the game is not consistent in its rules and how the mechanics work from battle to battle. The thrust attack that’s supposed to always cause damage on block doesn’t always work on bosses. Bosses can use their uninterruptible attacks so fast that you literally can’t react by the tell on screen. Sometimes, even their normal attacks would go through my block, and then a minute later the block would hold. There were cases where even dodging at the right time to avoid an attack, I was still hit by the attack tracking me or an odd hurtbox connecting. Enemies can automatically block attacks, but there were cases where the game was not recognizing that I was holding the block button. I always felt like no matter how well I played, the posture bar was always near full. I also noticed cases where the speed at which it would be reduced changed during combat; regardless if I was holding block or not. The stealth design could have been more developed; especially with how much it is a core gameplay system. Once an enemy spots you, all enemies in the area know where you are. Even if you break line of sight, they can still hone in your position regardless. Given the size of the environments and all the ways of moving through them, I was really hoping for more uses of stealth and the environment — like the environmental kills from Hitman. And speaking of stealth, I found the ceramic pots that you could supposedly throw to distract enemies not working at all. Another point about stealth is that enemies can spot you a mile away if you’re standing up, but can walk around enemies at ease while crouching. What makes this troublesome is that there are actions that automatically break your crouch: like falling a small distance. As with God of War, I’m genuinely surprised that more people aren’t talking about Sekiro’s design issues and can think of a few possible conclusions. I can see Sekiro becoming a speedrunner’s favorite game, because it is so mechanical in its design — to the point that I could see something along the lines of a TAS (tool-assisted speedrun) being set up for it. Ultimately this is a hard game to critique, because everything here works on paper. If I read a design doc with these systems, I would call it an amazing game. The issue is in the implementation, and that can only be easily understood if you know about design. I would bet money that Sekiro will be receiving a major balance patch at some point, because the issues are in the details. At this moment in time, I cannot recommend Sekiro as either a spiritual successor to the Souls-Like formula, or as a brand new action game IP. This is perhaps the closest a triple-A game in 2019 has gotten to feeling like a kaizo game. If you’re looking for an action game that gives you the keys to the kingdom and says “go nuts,” then you want to look at something like Devil May Cry 5. Sekiro Shadows Die Twice is for people looking for a challenge that is all about “solving the equation” of the design. Even with that said, I never felt joy beating any of the bosses in this game, instead I felt exasperated over the fact that either the camera didn’t screw me up, or my button presses actually took. I’m honestly wondering if I should re-buy the game on the PC at some point just to see if there is a major difference. Regardless, this is a game that is going to be talked about by action fans for months to come — whether that’s good or bad remains to be seen. And one last note before anyone decides to post about my “gamer skill.” I’ve beaten every Devil May Cry game, every Soulsborne, Ninja Gaiden Black, Nioh, God Hand, even Dante’s Inferno on the hardest difficulty, so I’m not a novice at action games.